Club Penguin Cheats by Mimo777 Club Penguin Cheats by Mimo777: Club Penguin's Top Secret EPF Message! thats the dragons from knights quest 3! Blackout is coming. Herbert and Klutzy are inside in some robots, they can cause the earthquake and then will be blackout (there will be no light in the Lighthouse or anywhere else). Maybe a new mission. OMG my dream that I had about herbert controlling the hydra was true! Get ready for something EPIC! That's Great, can't wait to see what Herbert is up to..
Mimo! This may also have to do something with the "Blackout"! They're the dragons from the medieval party! Get ready! We're bringing them down for good this time! They are in the hydra's heads! Yeah they're definately controlling the dragons, I wonder if there is somebody in the red dragon as well? 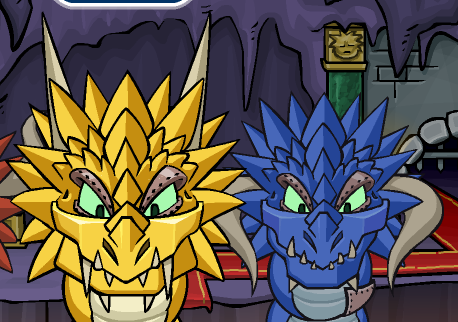 Okay if they are in the yellow and blue hydra heads what about the red one...? I tryed to get to the Club Penguin Beta Team by clicking on the link where it says 'Team' but there is no link anymore. Is there any other way of getting on to it than through that link? If so could you please post it or the web address on your blog so i can get onto it. Well if they are in blue and yellow dragon heads who is the red dragon? I have just noticed that when you click on the tree-houses in the forest the load screen briefly flashes up with "Desert Dimension". mimo ! that could be suspicios device !!! Um acctualy it doesnt say herbert is going to attack next week it says Herbert is planning something big, and it could be an attack on the EPF! Stay on alert, agents! The question is who's in the red one. If they're in the blue and yellow one, do you think the other crab that they were getting is in the red one? Is this happening to other people? Is it another club penguin bug or herbet stolen are spy phones? Wow I didn`t even notice that... nice one Mimo! You rock! Well if Klutzy and Herbert are in 2 of the dragons heads who is controling the other dragon? if kluztzy and herbert are in the blue and yellow whos in the red mabey a herbert decoy or klutzy decoy of the them selves. maybe protobot is the other dragon! Here is something for you without trying to hurt your feelings "I'll let you in on a little secret...Herbert is planning to attack the EPF next week!" I've seen a film before when the director turned out to be evil, but I don't think our Director would do that, but there is the 10% chance it could happen. The device JPG found was a tracking device by the way.